DJ Marshmello, who is currently on India tour, has presented a thrilling new song for his Indian fans. The American electronic music producer recently collaborated with music composer Pritam and YouTube sensation Shirley Setia for his first Hindi song, Biba. The new track is a tribute to Shah Rukh Khan’s popular films. 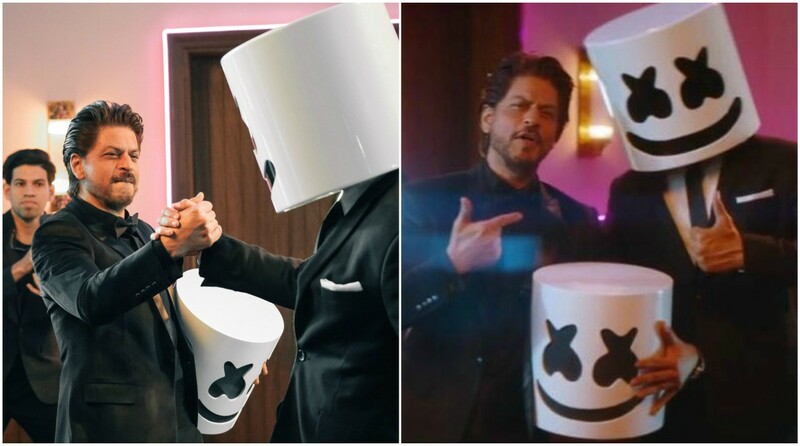 In the video of Biba, Marshmello could be seen recreating the iconic scenes from SRK’s films such as Dilwale Dulhania Le Jayenge, Kuch Kuch Hota Hai, Devdas, and Om Shanti Om. On Friday, Marshmello took to Twitter to share a short clip from the song, in which we witness Shah Rukh Khan’s cameo. Meanwhile, the popular DJ is gearing up for the Vh1 Supersonic 2019 to be held this weekend. “India is so special to me. This is my third time here (in India) and I love it even more each time I come back,” Marshmello said in a statement. “That’s why I wanted to make this trip even more special and give my fans here their own anthem. It was great to work with (composer) Pritam over the last few months and give the Mellogang ‘Biba’,” added the artiste. Prior to his performance here on February 17, he released the music video of Biba.